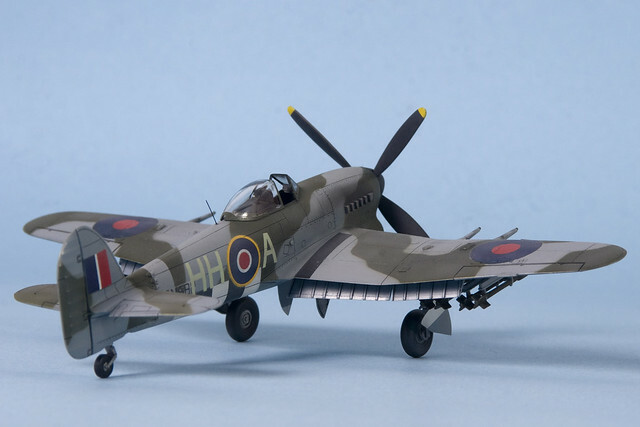 This Academy Typhoon 1B is one of the better offerings from the Korean scale model manufacturer. A relatively inexpensive kit, this version of the famous WW2 tank buster is meant for the average and novice modelers to enjoy. It has great fit and surface detail – with fine rivets and panel lines. 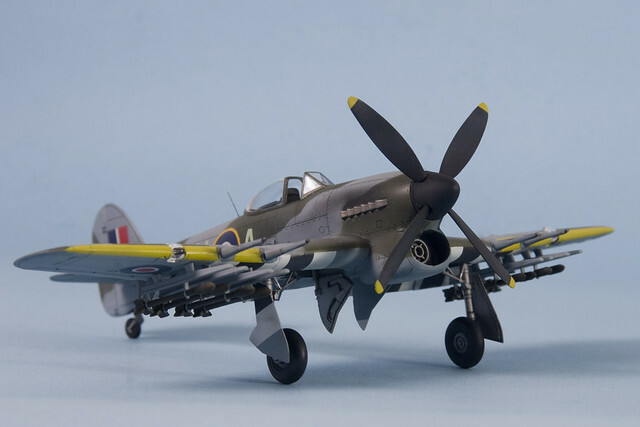 Yet, it still has relatively few components to work on – enough to give young modelers the enthusiasm to start on the hobby as well as seasoned adults the chance to make a quick build. A nifty 1/72 scale kit with a lot of nice surface details. I bought mine for less than $8 USD. If this is too boring, you could always scratch-build or super-detail it. I do recommend you to buy after-market decals to replace the stock decals which is pretty hard to work with. For the advance, this kit will give you the opportunity to flex your scratch-building techniques and have a go at some plastic surgery. With its almost rock bottom price (I bought mine for just under $8 dollars) you can do the simplest modification such as adding seat belt harness to the more complicated ones which might include anywhere between adding parts of a PE set to conversion using resin engines. Being a very simple kit, there is not much to see and do before you glue the fuselage halves together. Pay particular attention to the interior colors. Based on my references, the walls are flat black and the tubing structure is aluminum. For me, I choose a middle path: sawing off all those movable surface panels to show it in the dropped position. I guess the reason was because I had to come up with a balancing act for a “group build” under a “Allied Normandy invasion” theme that my local modeling club will hold in the coming month. I am giving some final touches to the seat harness. The seat is stock from the kit, while the harness is Tamiya masking tape cut to length. I sprayed the seat a light mist of Tamiya Flat Aluminum and I painted the belts with Humbrol Dark Earth. I painted the cockpit with Tamiya enamel Flat Black and the chairs Tamiya enamel Flat Aluminum. The color references from the Internet differs from the ones in the instruction sheet. Being only less that thirty days away, I thought that making a build with a major focus on re-creating the D-Day stripes and modifying the movable surfaces would be smartest way to satisfy my “advanced modeler syndrome” without overshooting my deadline. I drilled the holes on the wings for the rocket launchers using my trusty pin vice and micro drill set. These drill comes in a set of 20 micro drills. I bought mine for $15. The investment goes a very long way. The kit is almost perfect, except….for the starboard wing root. This is the only part of the kit that needs major filling. Since I saw off the flaps, there were some consequences. This includes the large gap that was generated a the base of the wing root. This needs a major fill-up. I use plasticine to correctly measure the wing’s thickness to make the inner wall. At this point, the wings are not yet glued together. And i was easy for me to figure out how much styrene i need by measuring the Plasticine’s height. Dry fitting the elevators. I use copper wire to secure them. I got the copper wires from old telephone cables. Dry-fitting the modified flaps. I created the inner frames using 0.25mm sheet styrene. In the end, I really enjoyed working with this kit. I think this project improved the look and feel of the Typhoon. With a straight build anyone could come up with a decent model within a couple of days – sort of a “weekend kit”. I completed mine between approximately 25-30 hours which includes all the scratch-build add-on. If you are making a similar build, here are some ‘work-in-progress’ photos for you to enjoy.